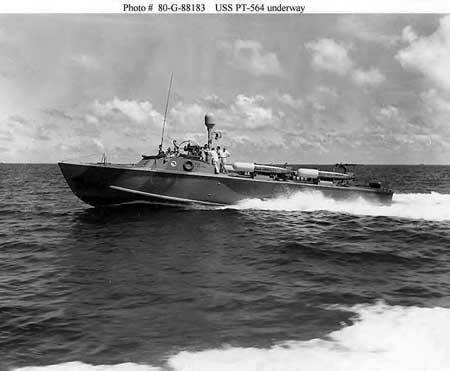 There were actually four classes of PT boats in the USN in World War II, excluding the eight (Higgins Industries actually built two PT-6s, one of which was sold to the British) experimental designs and the British (by Scott Paine) built PT-9 and the ten seventy foot Elco seventy foot PT-10 Class boats, which were, after a testing period by the USN, turned over to the British Royal Navy. PT-20 Class: seventy-seven foot boat, based on the PT-10 Class design, built by Elco. PT-71 Class: seventy-eight foot boats, built by Higgins Industries. PT-95 Class: seventy-eight foot boats, built by Huckins. PT-103 Class: eighty foot boats, built by Elco. Each of the classes had one or more sub-class within its production run. There were also four boats used by the USN in the war that were based on the Scott-Paine design and built in Canada. These were seventy foot boats and bore the numbers PTs 368-371. They were originally destined for the Dutch Navy, but were taken over by the USN when the Dutch forces were beaten by Axis forces. PT-191 was one of the last boats in the first series (PTs 103-196)of the PT-103 Class. The 103 Class boats were initially armed with two sets of twin .50 caliber machine guns, a 20mm Oerlikon anti-aircraft gun, four torpedo tubes or two torpedo tubes and eight (four to a side) roll-off racks for depth charges (the 300 pound charge variety). PT-191 was an unit of MTB Squadron 12, and spent all of her career in that Squadron. She survived the war, however her final fate is under debate. She might have ended up in private ownership or she might have found her way into being an asset of the C.I.A in its infacy. The Wartime Experimental Higgins PT-564, The "Hellcat" In 1943, Higgins Industries decided to attempt to save weight and increase the speed of the boats. This was achieved on a smaller hull (70 feet) that had less mass in the area of the upperworks. That meant more speed for the boat. The Hellcat was faster than the production based PT boats of the time. The boat was armed with two twin .50 caliber machine guns in turrets, a 20mm Oerlikon anti-aircraft gun on a tripod mount and four lightweight Mark XIII torpedoes, mounted in lightweight side-launching roll-off racks. Tests were also performed with mounting two sets of twin .50 caliber machine guns side-by-side on the foredeck and firing them remotely from the cockpit. It was found that the Hellcat was too small to carry the extra added guns carried by the boats in action at that point of the war to the later stages of the war and the design was not put into production. These are examples of the first batch of the PT-71 Class boats manufactured by Higgins Industries of New Orleans, Louisiana. The same company that built the LCVPs that stormed the beaches on D-Day. These boats (units of Squadron 13) pictured here served in the Aleutian Islands in Alaska in late 1942 into 1943. They returned to Washington state, where they were refitted and received upgrades and went onto to serve in the Southwest Pacific. 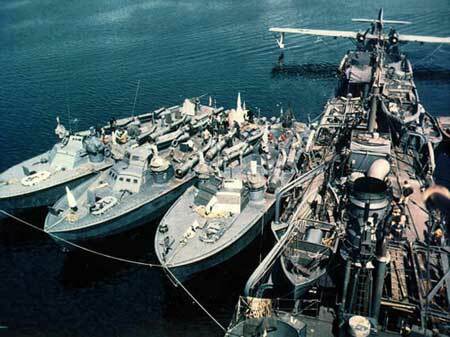 I'm not sure if they are pictured here, but unfortunately, two of Squadron 13's original boats, PTs 77 and 79 were lost on the last day of the war by friendly fire. A case of mistaken identity and miscommunication. 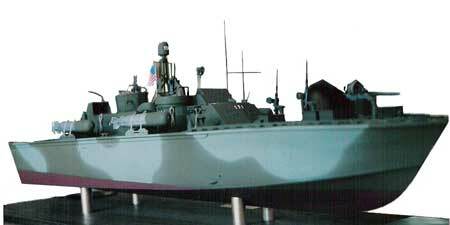 PT-66 was an example of one of the second series of the seventy-seven foot Elco PT-20 Class PT boat. You can barely make out three "extra" .50 caliber machine guns on the foredeck. These were field modifications made by the crew. Report on PT Boat action during the attack on Pearl Harbor available here.